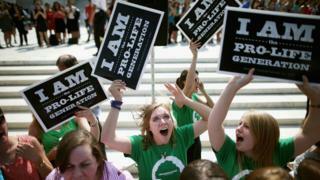 Lawmakers in the US state of Oklahoma have passed a bill that would make the act of performing an abortion a crime. Under the bill, a doctor who performs an abortion could be sentenced to up to three years in prison and be barred from practising medicine in the state. Abortion is legal in the United States and abortion-rights activists say the bill is unconstitutional. The legislation now heads to Governor Mary Fallin who has previously backed curbs on abortion. Two abortion clinics remain in Oklahoma after the state recently enacted a number of new regulations on the facilities. Ms Fallin, a rising star in conservative circles, has been mentioned as a potential running mate for Republican presidential candidate Donald Trump. Anti-abortion groups said they hoped to use the bill to trigger a legal case that would overturn Roe v Wade, the Supreme Court verdict that made abortion legal in 1973. Legislation similar to that in Oklahoma was enacted in Utah and Louisiana in 1991 but the laws were later ruled unconstitutional. In recent years, conservatives have sought to tighten restrictions on abortion clinics and doctors rather than seek an outright ban. Abortion rights advocates say these measures are meant to restrict women's access to abortion. The new laws are particularly widespread in conservative southern states. This week, South Carolina's legislators passed a bill that would bar abortions after the 19 weeks of pregnancy.